(In)visible hands behind sweet industry – What does it take to prepare Sar? The invisible hands that toil day and night to keep the sweet industry of Bengal often go unnoticed. One such skill that has gone undocumented is the art of preparing Sar. One of the artisans in fact lamented to her family member, ‘This work requires skill of eyes and fingers but you will always remain in the backyard. No one is ever going to recognise this craft, this skill’. Sar is one of the key ingredients of Sarbhaja – a sweetmeat of Krishnanagar prepared from Sarpuriya Pak which constitutes of Kheer, cardamom, Sugar and saffron. Artisans in sweet shops prepares the pak (cooking process of sweetmeats across Bengal is called Pak). The slow method of cooking which produces a soft texture in sweets is called norom pak and the method of cooking hat will give a harder texture is called kara pak. In case of Sarpuriya, what the artisans don’t know to prepare or in modern day terms what is outsourced is Sar. Sar is the Bengali word for cream that floats when full rich creamy milk is boiled. Till I went on my sweet trail to Krishnanagar I was not aware about the art of preparing Sar. This cream is used to prepare Ghee (clarified butter) in many households across India. Krishnanagar is the birthplace of Sarbhaja and Sarpuriya two sweets where you need Sar. Currently approximately ten households in Krishnanagar prepare Sar. I was fascinated to see pairs of Sars piled up in the cupboard of Bijoy Moira a shop tucked away near to Judges Court T point. I was alerted that Rabi Ghosh from Khottapara (name of the neighbourhood) is their Sar supplier. If I wanted to take a look at how Sar is prepared I should visit their home. Though I felt slightly hesitant to enter somebody’s household without prior appointment I decided to take a chance last afternoon. Around 1.30 after finishing my lunch I boarded a rickshaw to Khottapara to reach Robi Ghosh’s house. Baby Ghosh has been involved in the art of preparing Sar ( lifting the cream of the milk to form a stiff base. She learned the art of preparing Sar from her father-in-law. Robi Ghosh proudly tells me “very few Ghosh* households are skilled in this trade”. Interestingly, across Bengal people involved in milkman trade are referred as Goalas (Goala is one of the sub-castes specialised in milk related trade). Some sections of Goalas are skilled in this trade. Baby gets up around 5 am and waits for her husband Robi to collect milk from the nearby villages of Krishnanagar. Robi Ghosh tells me, “You need good quality milk. You cannot prepare Sar with adulterated milk”. Usually by 12 noon Robi is back from the villages. Once the milk is collected Baby heats the milk and keeps it aside to cool down. She has a mud floored room for the preparing Sar. It is a small room with two clay ovens for heating of milk. Baby starts preparing Sar from 12.30. She has 15 kadais for preparing Sar. At one time she can prepare one Sar. She takes small portions of cow dung cakes and distributes it evenly across 15 places. 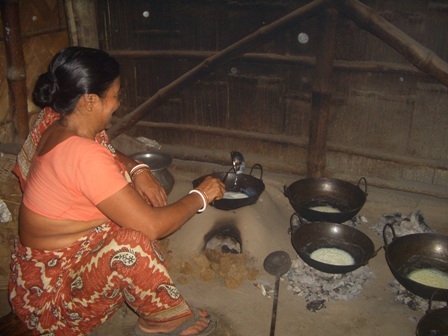 She places 15 Kadais and adds small portions of milk and keeps on stirring it for the first thirty minutes. She has to keep a keen eye and wait for the cream to settle. After that she lifts it carefully and spreads in on a wet cloth covered bamboo basket and allows it cool down for 2 hours before spreading on a wooden mat to cool down. The soft tender cream becomes a solid base and it becomes ready to use after 4 hours. Baby says, “It is easy to prepare sar during winter. In rainy season it becomes hot and humid and takes time”. I leave her to finish her order of 80 Sars to be delivered across sweet shops in Krishnanagar. Each sar costs about Rs 13- 15 each depending on the quality. As I leave the house Robi Ghosh shows me the place where he has stored cow dung cakes and Baby quietly returns to the room to finish her orders. *Commonly people in this area call Goala households as Ghosh households. Across Bengal people from both Goala Caste Group and Kayastha caste group share the surname Ghosh. The gastronomic culture of Bengal is well known for its affinity towards sweets; particularly “rosogolla” and “sandesh”. Rosogolla is a round shaped sweet made out of Chhana (cottage cheese) and dipped in sugar syrup. Sandesh on the other is a sweet made of kneaded chchana cooked with sugar/ jaggery and made into diffferent moulds. While there are debates as to who invented Rosogolla it was the enterprising family of Nobin Chandra Das and his successors primarily K.C.Das and Sharadacharan Das who were instrumental in putting the Rosogolla on the global map. Bengalis have a fettish for Chhana based sweets. What is Chhana? Chhana is an important base for a variety of sweets. It is obtained by acid coagulation of hot milk and draining out the whey. Nobin Das popularly known as Nobin Moira is known for his invention of Sponge Rosogolla. 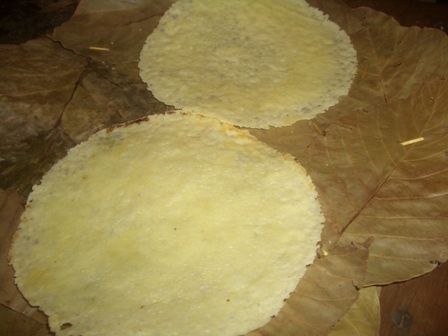 Langcha (a popular sweetmeat) in fact is named after Langcha Dutta who was a karigar from Kalna. He was efficient in preparing Pantua (Another Fried sweet made of Chhana and dipped in Sugar syrup) of huge sizes. Since he used to limp and walk hence the name Langcha (In Bengali Langchano means to limp). Surjya Modak from Chandannagore, Hooghly invented ‘Jalbhara Talsans Sandesh’ (1818). Bhimchandra Nag and Nakur Nandy from Hooghly district created revolution in Sandesh from their respective shops in Kolkata. My first field work was in a sweet shop in Chandernagore/ Chandannagore by the name Jalbhara Surjya Modak, descendants of the legendary Moira/ Modak (confectioners in Bengal are known as Modaks/ Moiras). Chandernagore is a former French colony ( For details on Chandernagore visit the link http://www.chandannagar.com/htmlfiles/chanhistory.htm). Unlike the rest of India, certain towns on the banks of the Hooghly river had Dutch and Portuguese settlements. For instance, Chinsurah a town close to Chandernagore was a former Dutch settlement and Bandel, few kms away from Chinsurah was a Portuguese settlement. These settlements have played a key role in the social history of sweetmeat in Bengal. While the earliest documentation on sweetmeats record “kheer” as the primary ingredient of sweetmeats with the advent of Dutch and Portuguese according to some scholars and traditions “chhana” became an important component of Bengali sweets. For instance, the web portal (link given below) of Jalbhara Surjya Modak credits the Dutch cook of Bandel Church ( a church where Portuguese sailors had stayed for a long time) for introducing the Moiras of Hooghly to Chhana. In 1818, on the occasion of Jamaishashti, the Bandopadhyay family of Telenipara, Chandernagore sent a request to Surjya Moira that they wanted us to prepare a sweet which will surprise their son-in-law. 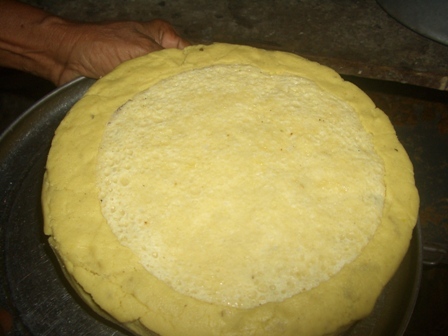 The first step was creation of a Talshansh sandesh (a sandesh/ sweet shaped like the kernel of a palm). The dice for this Talshansh Sandesh was invented by Surjya Modak’s grandson, Lalit Mohan Modak who was an experienced hand. In those times Siddheswar Modak(Lalit Mohan Modak’s father) used to run the shop. The dice (shaped like kernel of a palm) was filled with Kara-Pak (slightly harder vesion of cooked chchana) sandesh to which rose-water flavoured sugar syrup was added. In those days sugar syrup was made of dolo chini(a variety of locally produced sugar). This sweet was sent to the Gangopadhyay family. When the son- in- law was offered this sweet, the moment he bit into it the water spilled over this clothes. Following this incident Jalbhara Sandesh became popular. Then orders came on pouring in and Surjya Modak became famous for introducing Jalbhara. Jalbhara Talshansh Sandesh was its real name. Now it is popularly known as Jalbhara Sandesh. Our Jalbhara Sandesh is unique as the “water” does not dry up”. In my several interviews with Saibal Kumar Modak we have discussed why Surjya Kumar Modak is credited with the invention of Jalbhara considering his grandson Lalit Mohan Modak had prepared the dice. Again he alluded to the fact that everyone in the area knew the product was available at Surjyi Moira’s shop. So next time you want to try out give into your sweet temptations visit Jalbhara Surjya Modak for Jalbhara Sandesh, Motichur Pak. They even sell Mango filled Jalbhara. Since the shelf life of Bengali sweets is short put on your shoes and take a tour of this former French Colony and finish off with a visit to this legendary shop.